My wife has a paid off 2011 Hyundai Elantra. We got a note from a dealer that says a customer wants it to replace a totaled one. Looking at their used inventory online, they do not have a single Elantra. My question is... is this legit? Does this happen often? One of the ways dealerships get new customers is to reach out to existing customers to see whether or not they would be interested in trading their current car for a new one. The dealers also know that flooding your inbox with messages promising “HUGE SAVINGS” is an exercise in futility. Most of these messages end up in a spam box or get deleted without ever being read. So now the dealers are looking to go old school in the way of traditional mail and “personalized letters” to entice people into thinking that maybe they would consider a new car. 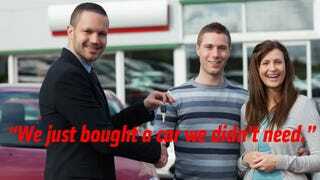 It plants the seed that a buyer could get “top dollar” for their trade, and pairs that with “rock bottom prices on all new models.” Many times they will spin some story about how they are “desperate” for pre-owned inventory; sometimes they will even go a step further and concoct some story about how your particular car is needed for a specific customer. Sure, they may have a shortage of pre-owned cars because they had a big sale month and blew out their inventory and of course they are always looking for nice trades that would make for an easy sale. But your car is not that special, if they really wanted your 2011 Elantra (or whatever other car they are begging you for) the dealer would go to an auction and find one. These letters are not about your trade, the primary objective is to get you physically at the dealership so you can be enticed by a newer car, with updated styling and cooler features. Chances are the dealership will even promise you to, “keep your payments exactly the same.” Of course if your car is paid off, I would try to take them up on that offer. Are these letters a “scam?” No, but they are pretty effective marketing to get folks that don’t really need a car into the showroom. So if you are not in the market and you get one of these notices, don’t over think it, just toss it in the trash.